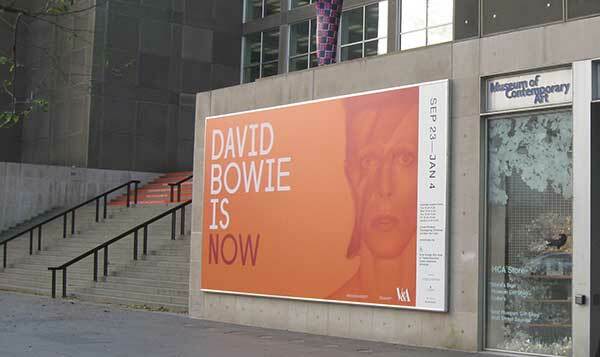 It’s hard to believe, but 72 hours ago, I was in Chicago, at the tail end of a fortnight-length vacation soaking up the David Bowie Is show at the Museum of Contemporary Art in Chicago. Ever since I returned from my last MCA visit in September, to see Bryan Ferry discuss his career and development, my wife was hot to wrangle a way to get to Chicago to see this event. Our options were costly and difficult… until it was discovered that our flight back from the West Coast, where we were taking a long vacation in October had a layover in Chicago on the return flight home. From there it was a pittance of money and effort to buy a one way ticket from Chicago and simply leave the plane during the layover. Several C-notes covered the extra expense; a far cry from the earlier plotting. So we went for it. What’s it like, you may ask? For a start, we were flabbergasted that this record-breaking show was only hitting The States in Chicago. We were expecting to take it in at the Atlanta High Museum of Art but the schedule through the next three years is explicit. For the next two years, this was it! The UK, Canada, Brasil, and Germany already had their shot at it. This made my wife devote a lot of energy to the task of how we could see it. When we realized our good fortune vis. the vacation flight layover, it was like receiving a gift. We scheduled our tickets for Nov. 2 at 10 a.m., coordinating our trek through the show with my acquaintance Cathy, whom I virtually met in the John Foxx Metamatic forum after being virtually introduced by OMD supremo fan Lori Tarchala whilst I was discussing Moogfest 2014 on the OMD forum. Lori’s friend Cathy was planning to attend so I was happy to give her food/lodging pointers. Meeting Cathy was fun, since fellow music geeks of her stripe are a rare pleasure for me. When I can slip into “binary mode” and talk about music stats and facts at machine code level with someone else is rare for me. She also attended the Ferry talk, so this made it a hat trick to visit an online music buddy three times this year. Nice. The audio portion of the show is a unique state-of-the-art program that is spatially responsive due to the GPS in the playback unit. The Sennheiser headphones play the correct audio based on the viewer’s proximity to the materials being viewed, be they multimedia installations, objects, or videos of performances. There was a little give and take, but the viewer quickly learned how to maneuver to obtain the correct audio stream. The MCA won the US bid for the show due to their extreme willingness and flexibility to give the show a full floor to devote to the exhibition. The contiguous space was immersive, but not precisely linear. It was possible to branch to different rooms in ways that did not adhere to a proscribed timeline in the artists’ life. This entry was posted in Core Collection and tagged Chicago, David Bowie, David Bowie Is, MCA. Bookmark the permalink. You are writing about all of my old haunts! I used to work at the Hancock building around the corner. I spent many a lunch hour roaming the rooms of the MCA. I certainly would have enjoyed this exhibit. Can’t wait to hear more. Brian – I can’t wait to write more! I have an appointment this afternoon, so lunch hour was curtailed as I am leaving work early. One day back from vacation and this unexpectedly bit me in the posterior. Cannot wait for this to hit the ACMI here in Melbourne! Didn’t think we’d get a chance in the near future but as Melbourne is the cultural heart of Australia, I’m glad this is coming in 2015! Rob C – It is an exhibit like no other. Prepare to enjoy it. There is a lot of nuance to soak up and the suggest 90 minute viewing time is a joke.